Medway is lucky to be within an hour of a wide variety of beaches around Kent so that you can soak up the sun in the summer months and relax by the sea. The road links to the coast from Medway are very good compared to other parts of the country. For example, places such as Margate can be easily reached via the M2 and Broadstairs by the M20. Like many motorways, they can suffer from traffic at times but it is not too often, especially if you leave relatively early. Brighton, which is in Sussex, is also relatively easily reached via the M25 and then the M23. The town of Whitstable has a national reputation for being a very nice town with lots of independent shops and places to eat and drink as well as a very pleasant, pebbly beach. The seafront and beach here and great for families as there are lots of activities for everyone to enjoy such as mini golf, rides and shops on the pier and arcades on the seafront. The beach is quite big so everyone can have fun on the beach and then cool themselves off in the water. There are also some nice walks that can be had right along the seafront with a lot of it being away from the hustle and bustle of the main seafront so you can get some peace and quiet if you need it. This pebble beach is located in Herne Bay, a few miles from the main beach there, and is actually within Reculver Country Park. Near the front of the country park are Reculver Towers which was originally a Roman fort and later became a Saxon Shore fort. 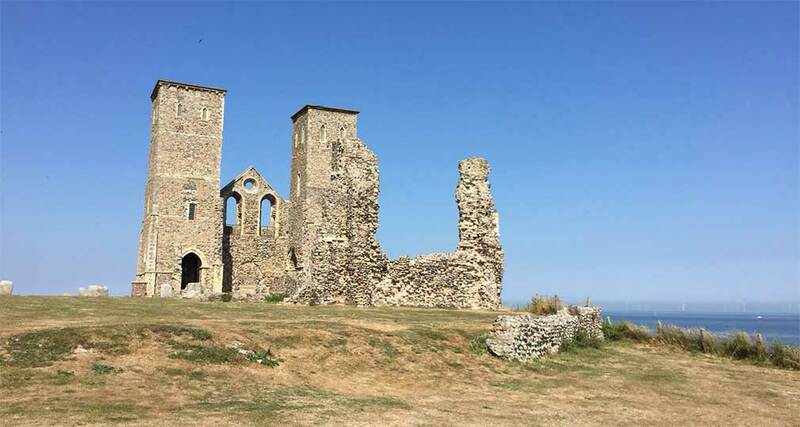 it 669AD the site became a monastery and then later the parish church for Reculver. The site is currently managed by English Heritage. There is ample parking within Reculver Country Park that you have to pay for. The car park is at the front of the country park so it is quite easy to find. There are free-to-use toilets located near the front of the country park and car park. The town of Margate has a lovely sandy beach and is one of the best in Kent. It is around an hour to drive there in the car from Medway and there are car parks dotted around the main part of Margate town centre. Margate has received a lot of attention in recent years as it has attracted investment into the Old Town with people coming in and opening independant shops, bars and restaurants. Many people from around the UK are taking trips to Margate to see what the fuss is all about and Dreamland re-opened a few years ago after being shut for quite a long time. The indie band, The Libertines, are also in the process of opening a hotel and music space in Margate which will further add to it’s hipster image. Margate was the setting for one of the most famous episodes of Only Fools and Horses which was the ‘Jolly Boys Outing’ episode where Del and the lads get a coach and drive down to spend the day at Margate beach and they also end up in Dreamland. Their coach blows up and they to find themselves hotels around town. Its a great tribute to Margate in it’s hey day and shows what a classic day out in Margate in the past was like. Today, there has been attempts to revive the town, especially Dreamland, which have had a positive effect and Margate is a lovely seafront to visit but it remains to be seen how this will improve things further into town as there has been little investment over recent decades and the town suffers from high unemployment. Whilst you could spend hours just lying on the beach soaking up the sun, there are a number of other interesting ways to spend your time in Margate. Dreamland has been reopened for a number of years now and, as well as the various rides that you could go on, they often have special events there such as live concerts and roller skating. There is also the Shell Grotto that is a 15/20 minute walk from the beach and is an interesting little place. It won’t take you long to look around but is well worth a visit as there are over a million (I believe) shells in this mysterious place. It’s not known why exactly it was made but there is some interesting information inside on its discovery and what has happened since. There is also a nice shop to have a look around. One of the main attractions in Margate is the Turner Contemporary which is an impressive art gallery that has new exhibitions regularly. There are also some spectacular views of the sea from this building and you can also enjoy some food and drink in the cafe while taking in the views. The Turner Contemporary also has a great shop with various gifts and items from the latest exhibitions taking place. There are a number of beautiful beaches in broadstairs such as Viking Bay, Botany Bay, Joss Bay and Stone Bay. Parking can be quite tricky but there are some decent car parks if you turn off the High Street but it is worth researching which one you want to park in before you go. As well as the sandy beaches, there are arcades in the seafront as well as lots of restaurants and often small markets that you can look around. The beach in Ramsgate is a lovely sandy beach and of a decent size so you can feel like you have a bit of space whilst also feeling like you’re not too far away from people. There are a number of car parks around the beach which makes it relatively easy to put your car somewhere while you lie on the sand for a few hours or go for a stroll along the seafront. There are some very nice high chalk cliffs that run along the beach and give you some great views from both the beach and on top of them. Ramsgate also has a harbour that is great for walking by and admiring the boats coming in and out and there are some great places along the seafront to get fish and chips or an ice cream. This is a bit further away from Medway than the other beaches mentioned in this article but is one of the most popular day trips from Medway as it is only about an hour and a half by car. There is a big beach in Brighton as well as one of the most impressive piers in the UK. Brighton is known as being one of the most diverse and coolest places in the UK with lots of shops in The Lanes and the main High Street and lots of places to get a drink of bite to eat. There are also various other places to go which are near Brighton and have beaches such as Hove and Shoreham-by-Sea. One of the closest beaches is located at Allhallows which isn’t the biggest and doesn’t have the best reviews but is around 20/30 minutes from Rochester High Street. There are loads of benefits to going to the beach. Doctors used to prescribe visiting the seaside to people as a way to get over various illnesses! When you go to the coast you will notice that the air you breathe is clearer, the people around you are more relaxed and the views you see will almost immediately make you feel more at ease and clear your mind. This will all raise your mood and make you happier! Medway is quite a busy group of towns and it can feel difficult to go anywhere else as there is so much to do and you may have lots of friends and family around you. However, just going somewhere different will help you to relax and is an exciting way to spend your time.